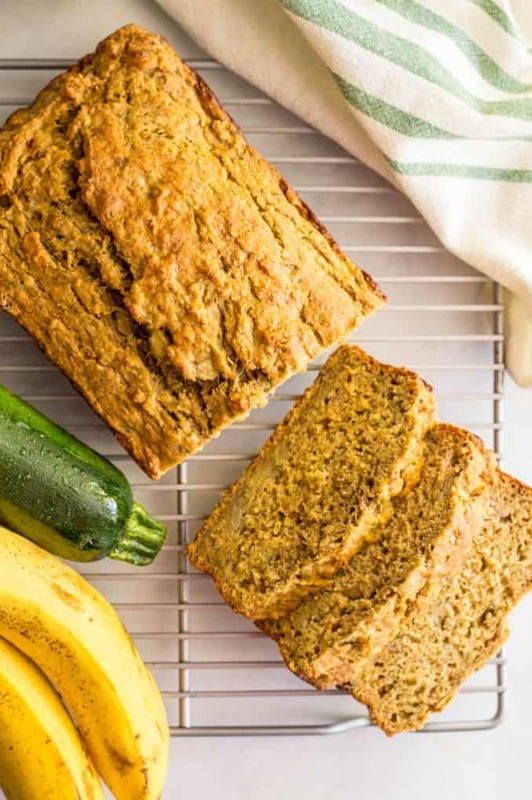 Whole wheat zucchini banana bread is a healthy breakfast or snack that’s super light and flavorful (no butter or oil) and a great way to get in some fruit, veggies and whole grains all at once! It’s just Thursday, but I am eyeing Saturday like a hawk. I’ve got my annual girls boat day all day on Saturday (which spills over into Sunday since we all spend the night at my friend’s house) and I cannot wait!!! So it’s kind-of unofficially zucchini week here on the blog. 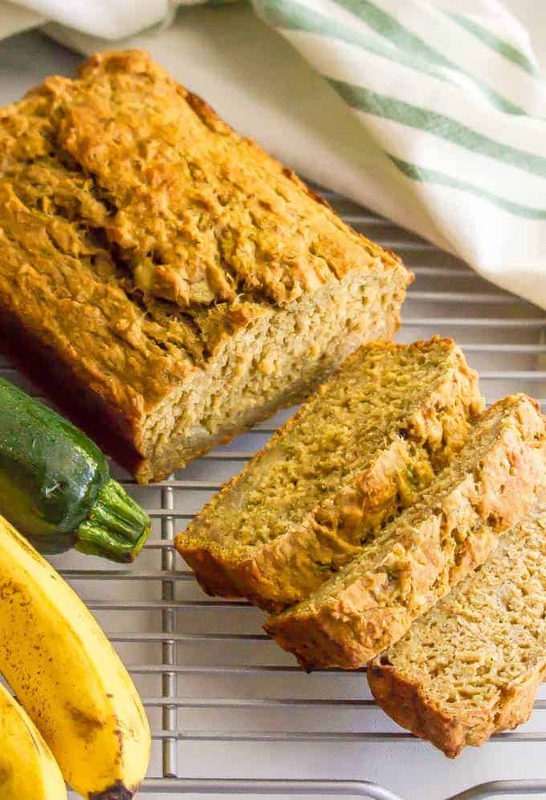 I shared my easy cheesy zucchini brown rice earlier this week and today it’s this lovely, healthy whole wheat zucchini banana bread that’s super tender and soft and just the right amount of sweetness. I grew zucchini in my garden at our old house and that’s when I started trying to find all kinds of ways to cook and bake with it because I had zucchini coming out of my ears. Luckily, it’s super versatile and can go sweet or savory, which I love. 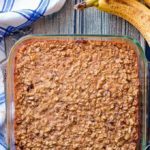 It’s delicious for breakfast, with coffee or tea, or as a morning or afternoon snack. My kids devour it any time of day! 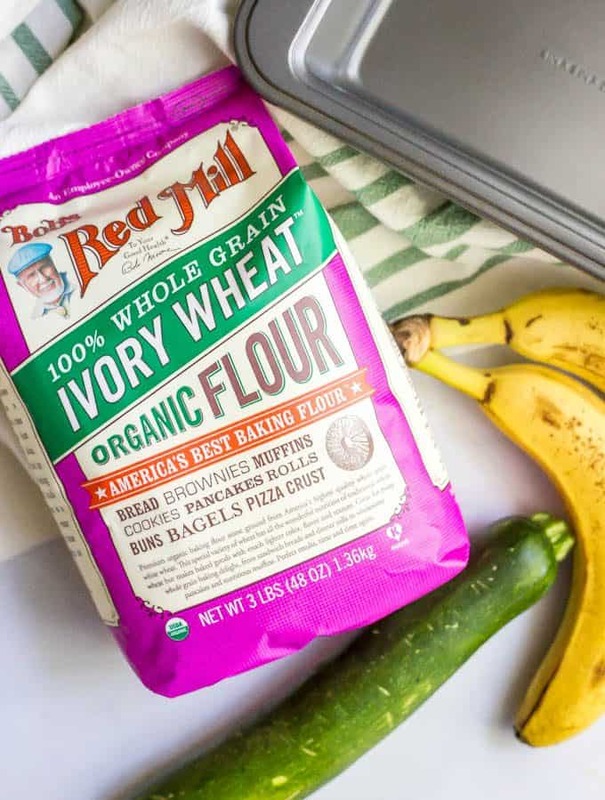 I’m also so happy to be partnering with Bob’s Red Mill again and using their organic Ivory Wheat flour, which is my go-to for baking. 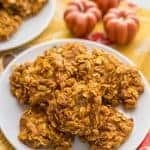 I use the Bob’s Red Mill organic Ivory Wheat flour but you could substitute their stone-ground whole wheat flour, their all-purpose flour or their gluten-free flour if you prefer. Need this to be dairy-free? I’ve made it before and used 1/2 cup unsweetened applesauce to replace the Greek yogurt and milk. It came out great that way, too. 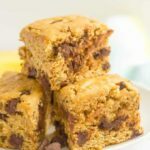 You could also try adding in 3/4 cup semisweet chocolate chips to the batter if you want to sweeten this up. This bread keeps great but you should put it in the fridge after the first two days. (I do this will all baked goods that have mashed banana in them.) You can also freeze it for up to 3-5 months. So go grab some fresh zucchini from your garden, the farmer’s market or your nearest store. And then whip up some of this delicious bread! 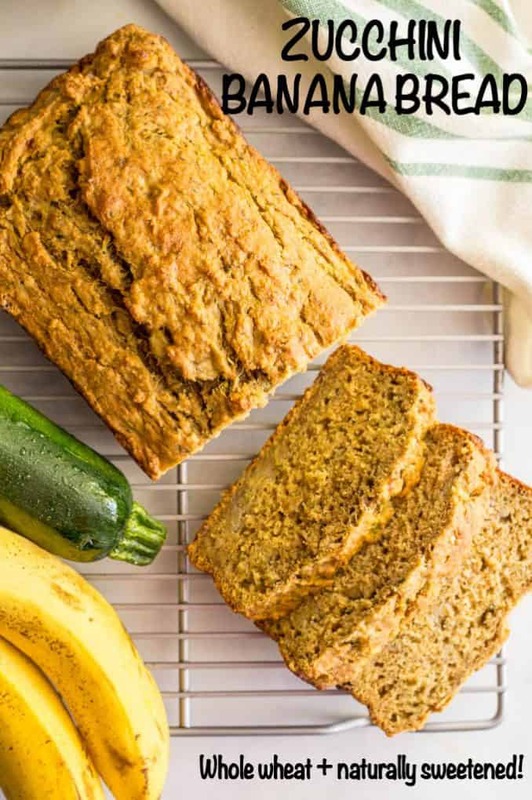 Whole wheat zucchini banana bread is a healthy breakfast or snack that’s super light and flavorful with no butter or oil. In a medium bowl, combine the flour, cinnamon, baking powder, baking soda and salt and mix well. In a separate large bowl, mash the bananas and then add the honey, egg, Greek yogurt, milk, vanilla and zucchini and mix well. Pour the batter in a well-greased 9x5 bread pan. Bake at 350 for 45-50 minutes, until a toothpick in the center comes out clean. Let cool in the pan for 5-10 minutes, then turn out and cool completely on a wire rack. Store leftovers in the fridge after two days. 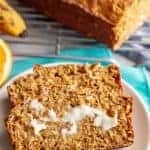 This bread also freezes great and can be kept 3-5 months in the freezer. Need this to be dairy-free? I’ve made it before and used 1/2 cup unsweetened applesauce to replace the Greek yogurt and milk and it came out great that way, too. You could also try adding in 3/4 cup semisweet chocolate chips to the batter if you want to sweetened this up. 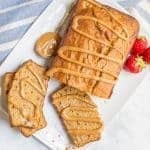 We love this bread on its own but you could also serve it with a smear of butter, peanut butter or a chocolate hazelnut spread. We just picked the first zucchini from our garden and I know what I’m going to make! 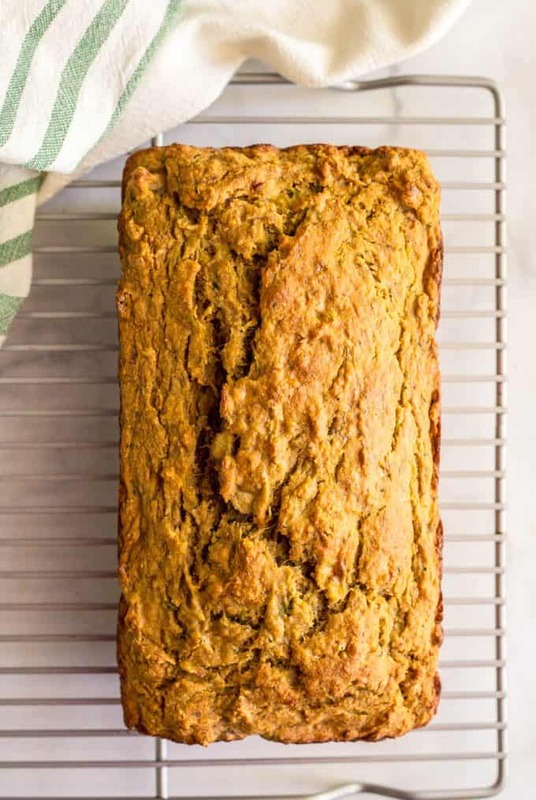 This whole wheat zucchini bread sounds amazing! 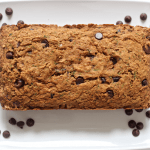 Love baking with whole grains! Mmm, mmm – this bread looks amazing! So healthy and delicious! Love that you use Greek yogurt!